Home Innovation Research Labs recently found that the builder community is adopting off-site home construction methods at an increasingly fast pace. 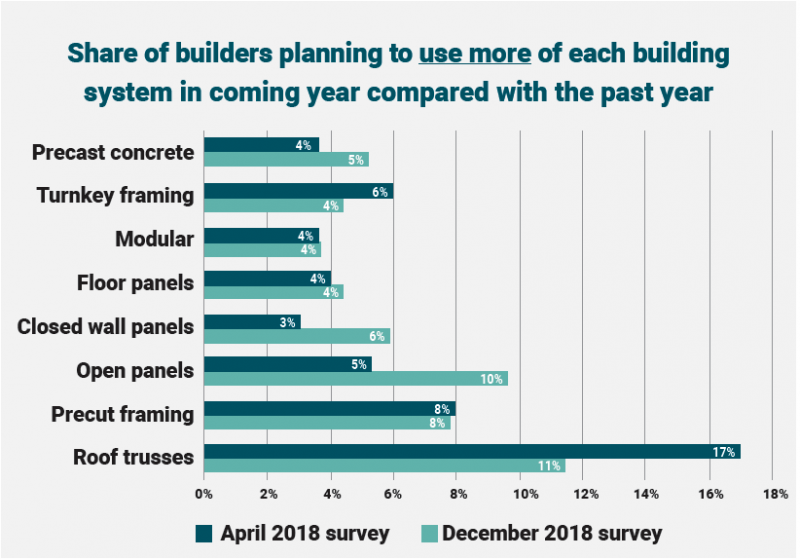 The research organization surveyed builders in April and December of 2018 to analyze the changing sentiment regarding off-site building solutions. 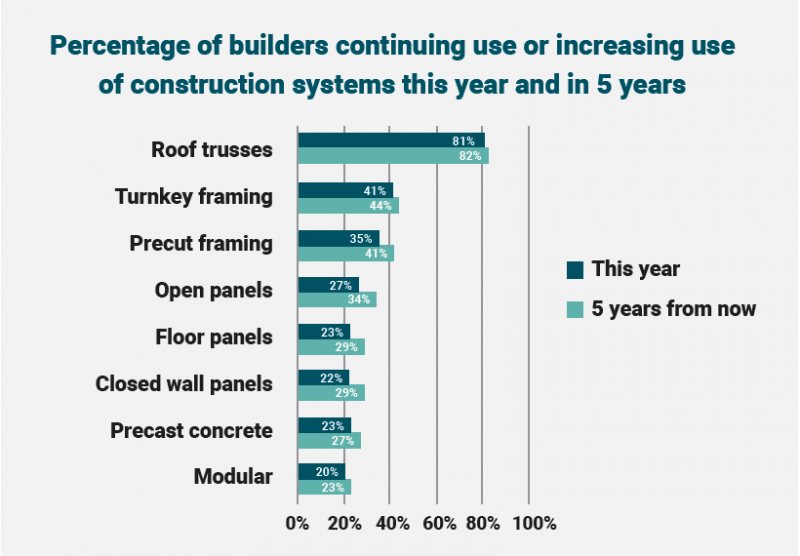 Home Innovation found that, across the board, builders had adopted more new technology by December, and that they anticipate increased use over the next five years. The group also predicts that no single off-site technology will monopolize the growing market; instead, a number of solutions will become more widely accepted. Roof trusses dominated both surveys as the top off-site solution that has already been adopted, with about 70 percent of respondents in April and December indicating they would continue using the method. Open panels and closed wall panels saw the greatest increase in interest, with the number of builders planning to use more of each method doubling between April and December. 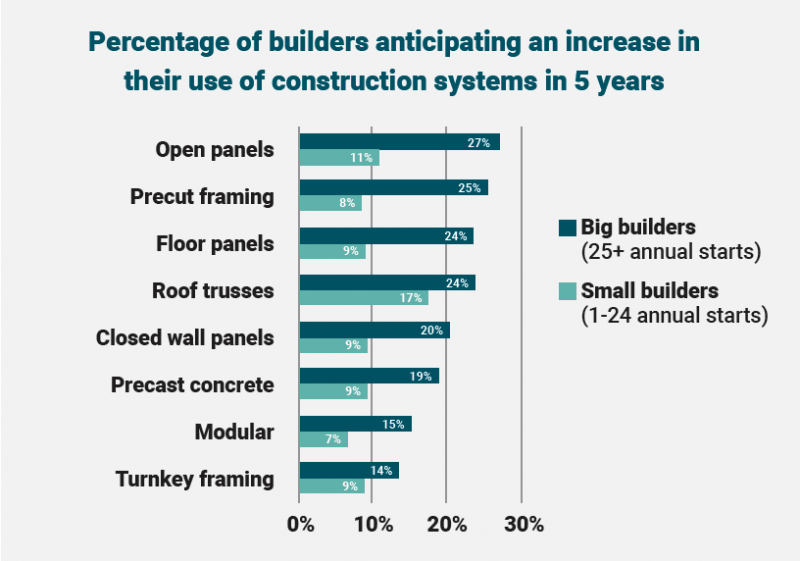 In every category, more builders are planning to adopt new offsite methods within five years than within the year 2019, indicating that while builder interest in these technologies is growing, implementation will take several years to play out. Categories that saw the greatest change between one- and five-year adoption timelines were, respectively: open panels, 27 percent to 34 percent; closed wall panels, 22 percent to 29 percent; and floor panels, 23 percent to 29 percent. Home Innovation suggests that builders are more willing to adopt open panels and floor panels because they are “a less radical change for builders than some of the other options.” Modular technology is well-established, but other methods, such as closed wall panels and precast concrete, will need to see their capacity for production and adoption grow. Large builders (those that build 25 or more homes per year) were more than twice as likely than their smaller counterparts to be planning to adopt off-site methods within the next five years. Of the off-site technologies, large builders plan to use open panels (27 percent), precut framing (25 percent), roof trusses, and floor panels (24 percent each) the most.